We will select four artists from the 12 recipients of the micro-bursaries to receive a larger bursary of £1500 in 2014/15. In addition to the bursary, these artists will receive mentorship (we will attempt to secure a suitable artist mentor for each FWD artist in dialogue with them) and producing and curatorial support to develop a site-specific project for Fierce Festival in October 2014. These are FREE and open to all, not just the Fierce FWD beneficiaries. Weds 21 May, 6.30 – 8.30pm: How I’ve kept going? Performance duo James Stenhouse and Gemma Pantin of Action Hero and Birmingham based artist Mark Storor, share their personal experience in staying motivated, inspired and staying afloat financially. These artists share the vital role of research in their practice; in both formal and informal contexts, shedding light on how the activity that happens behind the scenes informs their work and methodologies. Writer Diana Damian and online magazine editor James Smith, discuss the relationship of public writing to practice. They will share some examples of writing projects they have been involved in as well as exploring how to communicate your work online. About the identity: designed by Cody Lee Barbour. Cody was on the previous incarnation of Fierce’s emerging artist development scheme Platinum. 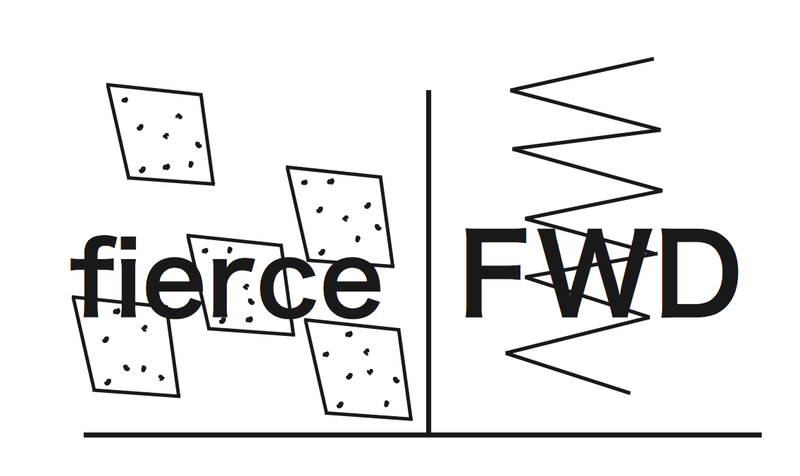 Fierce FWD is generously supported by Jerwood Charitable Foundation and Arts Council England.